It has been hot this summer. The wife and I are planning to move to Texas. During the move we will have to do a lot of driving with my two Beagles in the back seat of my van. There will be times when we will have to leave the dogs in the car for perhaps 30 minutes at a time. But, how do I keep them cool, when the car is baking in the sun? Using a wireless thermometer, I discovered that the inside of my van can reach dangerous temperatures. The highest temperature I saw was 147 degrees F, which took only 45 minutes to reach from a cool 72 degree condition. That kind of heat would kill my two dogs in short order. I don’t like the idea of keeping my engine running when we are gone for 30 minutes and I already tried running the van’s vent fans at full blast. Even with that much air, the inside temperature was only reduced by 20 degrees F. I need a more active cooling system. What I would like to see is a more refined system to the simple commercial cooling system shown below. A larger insulated cooler would be equipped with a small refrigeration system. 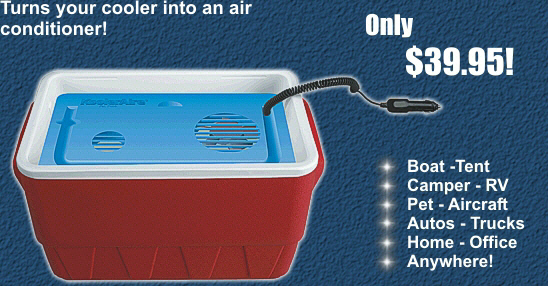 The cooler would be filled with ice cubes. A fan assembly would fit on top of the cooler, like the commercial unit. When the engine was turned on, 12v power would be routed to the refrigeration system, which would keep the ice from melting in the cooler and would actually begin refreezing the water in the cooler. When the car’s engine was switched off and the cooler’s fan turned on, the fan would draw hot stale air from the interior of the car and would push out cold air. The volume of the ice in the cooler and the air flow through it would be selected to keep the interior of the car cool, even during the hottest outside condition. Perhaps a solar panel on the roof of the car could power the fan.